The following article first appeared in AdvocateDaily.com, February 7, 2019. With the recent introduction of new partnership audit rules that set out who can represent a business before the IRS on tax matters, now is the time for partnerships — both U.S. and foreign — to act proactively to ensure they comply with the strict requirements of the new role, U.S. tax attorney (NY, DC) Alexey Manasuev tells AdvocateDaily.com. Last August, the IRS finalized the proposed regulations, requiring any foreign or domestic partnership that is subject to U.S. tax, with limited exceptions, to appoint a “partnership representative,” who will be responsible for communicating with the IRS on any audit or tax matters, effective from the 2018 tax year. The new role replaces the former “tax matters partner” that partnerships were required to appoint in earlier tax years, says Manasuev. 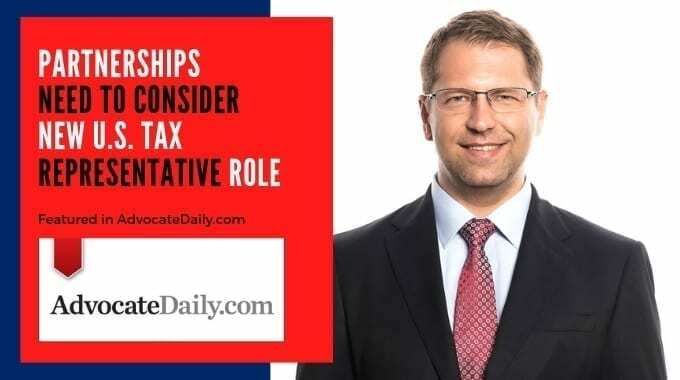 “The tax matters partner would sign the tax return on behalf of the partnership, deal with the IRS and other partners in case of an audit and other inquiries and matters involving the IRS. Generally, anybody could have been a tax matters partner — it could have been a business entity, it could have been an individual partner,” he adds. But while the partnership representative’s role is similar to the concept of tax matters partner, Manasuev cautions that the new regime carries much stricter conditions for who can fill the role. Matthews shoots…he scores…big tax savings!